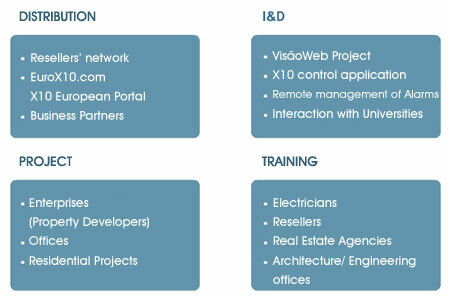 The EuroX10, the largest European portal dedicated to home automation, is an active component of the distribution process of the CentralCasa company and the outcome of a national project which began in 2002. The purpose of this project is to be the repository of technical information on the subject, with documentation and pictures, and also to allow users to share their experiences through the available forum. It is managed by CentralCasa, which is incorporated into a group of companies with different competencies but with a common goal - development and retailing of products and services in the scope of home automation. The company is structured in 4 great areas of intervention; each one has a process manager, who is responsible for the area and for the maintenance of the quality system in the scope of the ISO 9001:2008 certification.